Get it in front of millions of buyers! The holiday season is in full swing, and so is your quest for gifts that impress. If you can get lots of them under $10, all the better. On Christmas morning or during the eight days of Hanukkah, you may only have one or two loved ones to surprise or a list of people as long as your arm. This calls for some creative shopping that gives you more bang for your buck, and on that front, The Free Auction has you covered. 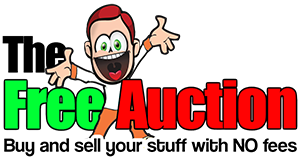 Regardless of whom you are shopping for, the Under $10 corner of The Free Auction has gifts in every category you can imagine. Christmas Gifts for Men. Whether the men on your list are gamers, anglers, or automotive nuts, you came to the right place. The top Christmas gifts for men, from fancy bi-fold leather wallets, to graphic tees featuring snarky jokes, to car gadgets like cellular phone mounts and bullet chargers are all in good supply here, and many of these make great Christmas gifts for teen boys, too. Christmas Gifts for Women. The ladies in your life deserve a little treat for themselves, and here is where you can find some of the best Christmas gifts for women. Consider makeup from brands like Nyx, Mary Kay, Bare Minerals, and more. Necklaces, earrings, and rings of all sizes and styles make thoughtful personal gifts. Browse stylish handbags from brands like Cerruti, Old Navy, and Joe Boxer so she has something to carry it all away with. Expand your net a little, though, because lots of these can be winning Christmas gifts for teen girls, too! Christmas Gifts for Girls. For the little ladies in your life that aren't quite old enough to think about contouring and labels just yet, consider any of the toy offerings here at The Free Auction make for some cool Christmas gifts for girls. Stuffed animals like the popular Pusheen line from Gund, Disney offerings like Winnie the Pooh, or the popular and nostalgic pound puppies give them something warm to cuddle as they settle down for a long winter's nap. Consider also any popular board game or popular toys like Shopkins and Hatchimals as Christmas gifts for tween girls. Christmas Gifts for Boys. Do you have a son, grandson, or younger sibling that's a die cast car fanatic? Good Christmas gifts for boys in your life may fall into this category, with toys and models coming from brands like Matchbox and Hot Wheels. Is there a new Playstation 4 or Xbox One hiding under the tree already, but you need some starter games to go with it? Titles like Destiny 1 and 2, Madden NFL 17, and Battleborn make cool Christmas gifts for boys that fall under the appropriate ESRB ratings. Here are some spectacular finds for the lowest prices you can give to anyone during the Holiday season.